Having lived in Williamsburg since 1995, I am very biased about what a wonderful city it is to live in. My husband, Roger, and I chose Williamsburg to raise our family, and to launch our real estate brokerage. #5 It’s the perfect climate. We enjoy all four seasons here, with beautiful Falls and spectacular Springs. Our Winters are mild, and we get just enough snow for the kids to enjoy it, and the summers are warm, but not overly humid, averaging temperatures in the 80’s. #4 It’s a college town. 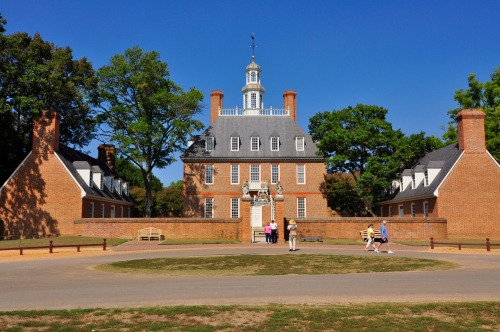 Home to the College of William & Mary (the second oldest college in the country, founded in 1693), Williamsburg boasts all of the energy that a college town enjoys. Not only do you have the Tribe team spirit (especially if you enjoy football! ), but you have all kinds of college-related opportunities: The Virginia Shakespeare festival at Phi Beta Kappa Hall and free symphonia concerts at the beautiful outdoor amphitheatre at Lake Matoaka are just a few examples. The Christopher Wren Society offers a plethora of classes to seniors through its lifelong learning programs. #3 Location , location, location. Williamsburg is close to everything. Virginia Beach is an hour away, or you can really take a beach adventure to the Outer Banks of North Carolina in a little over 2 hours. Less than an hour to Richmond, and all it has to offer…and less than a 3 hour drive to Washington, DC. If you prefer the mountains, you can head to Charlottesville and enjoy Skyline Drive and the gorgeous Virginia Fall Foliage. 3 airports are within an hour and a half’s drive if you’re a jet setter, or if your family wants to come visit. And, there is certainly plenty to do while they’re here. Nestled in the heart of Virginia’s Historic Triangle, you literally feel as though you are on vacation when you stroll through Colonial Williamsburg or visit the Yorktown battlefields. #2 Golf and water! The area boasts many golf courses, both public and private, and a climate where golfers can enjoy play year round. Bounded by 3 rivers (the James, the York, and the Chickahominy), and just minutes to the Chesapeake Bay, water enthusiasts can boat, ski, fish, kayak and crab. #1 There are a variety of homes for sale in Williamsburg, offering options in every price range. We have a number of active adult communities, if you prefer 55+ neighborhoods. Many of our Northern friends are amazed at our low real estate tax rates (less than 60 cents per $100 of assessed value in Williamsburg proper! ), and impressed with the relatively low cost of living. Almost 25% of our population is over 50, so I guess they agree with me! We’ve also been named among the top locations to retire by both CNN and Money magazine in recent years. It’s definitely worth checking out retiring in Williamsburg, so give us a call at 757-645-4106 or drop us an email at concierge@lizmoore.com if you’d like to learn more about our fair city! Or download our eBook, 101 Reasons to Love Living in the Historic Triangle, and see what this area has to offer.